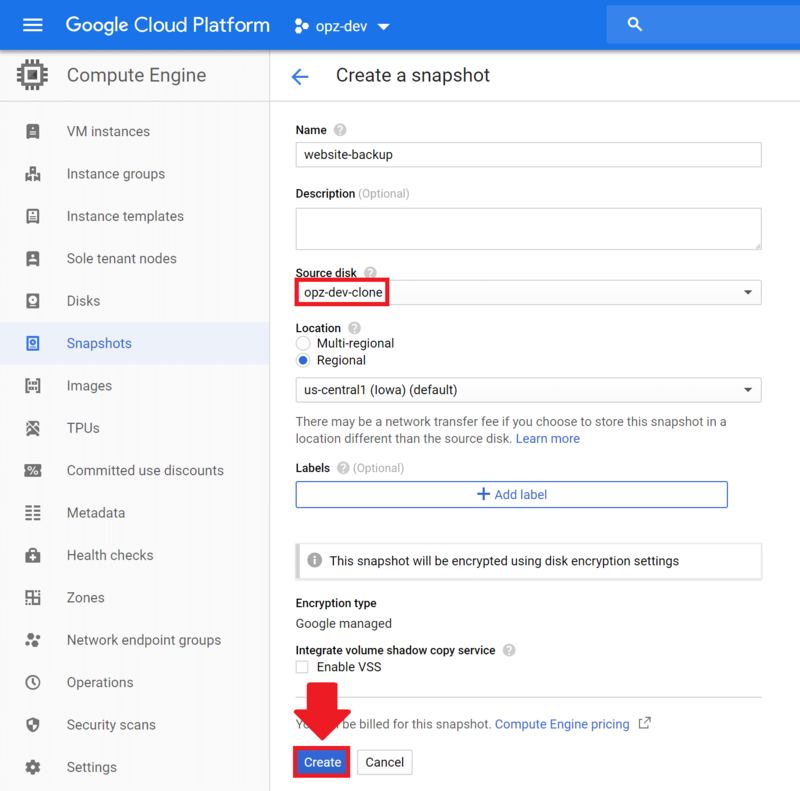 When running applications such as WordPress on Google Cloud, it’s important to have regular backups of your website – this way, you can quickly restore your website in case of an emergency. 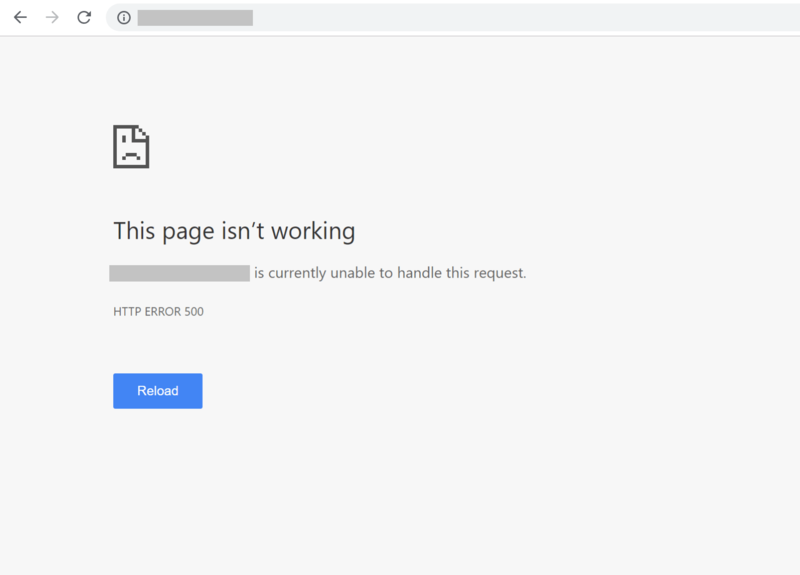 If your website ever goes down on Google Cloud, it’s possible to completely restore it in just a matter of seconds! 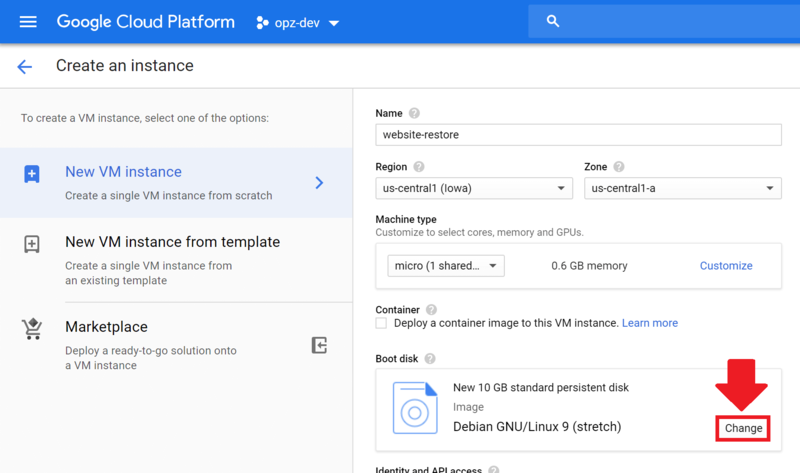 In this tutorial, you will learn step-by-step how to backup and restore websites hosted on Google Cloud. 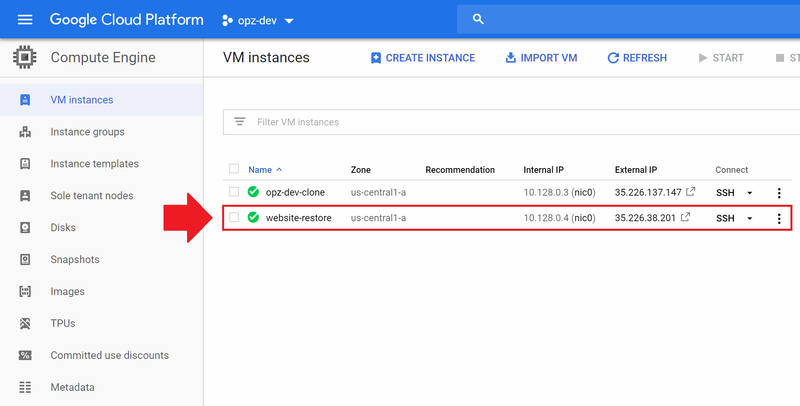 Before getting started with this tutorial, you should have already deployed a website on Google Cloud, and reserved a static IP address for your instance. In this section of the tutorial, you will create a ‘snapshot’ of the persistent disk that contains your website. 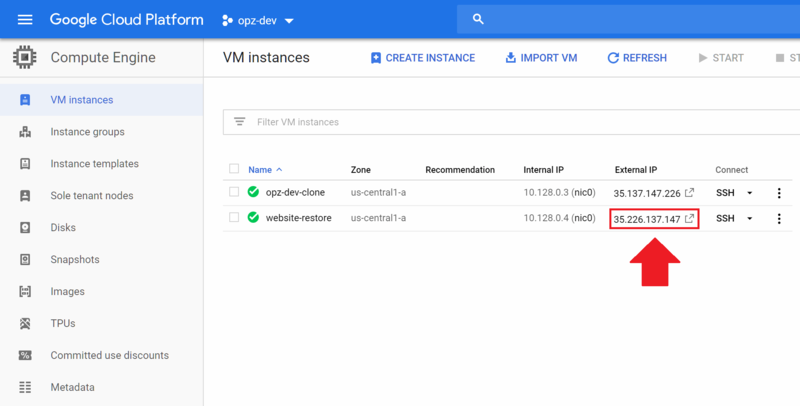 Snapshots are used to capture the ‘state’ of persistent disks at a given point in time, allowing you to restore your virtual machine instances in cases of failure. 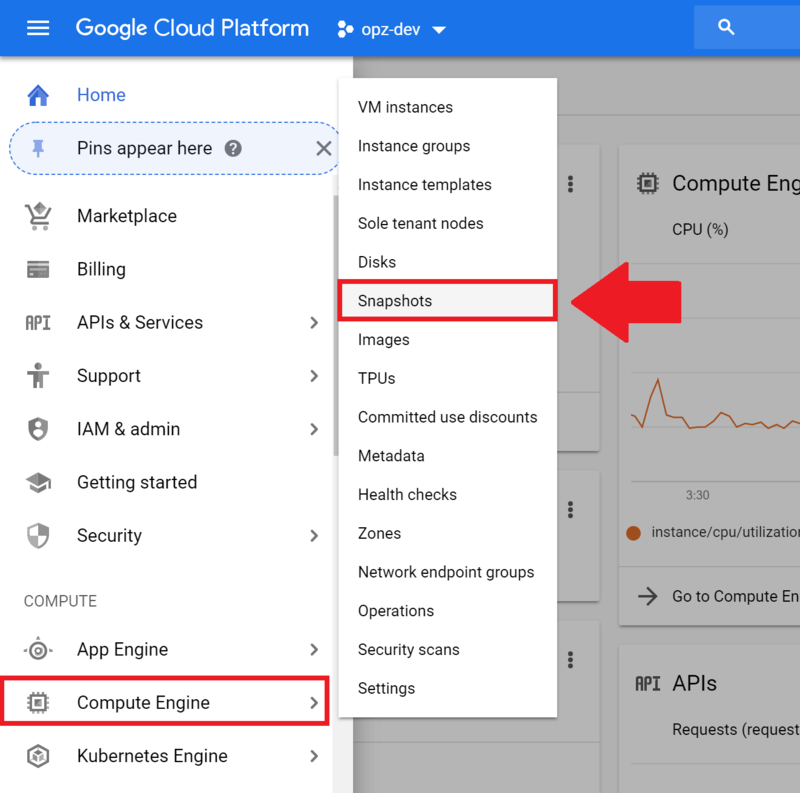 From your Google Cloud dashboard, click on the hamburger menu in the upper left-hand corner of the screen. Navigate to Compute Engine, then click on Snapshots. From the Snapshots dashboard, click on the Create snapshot button. In the Source disk drop-down list, select the disk that you’re backing up. Finally, click the Create button to save changes. After creating the snapshot, it will appear on your Snapshots dashboard. In this section of the tutorial, you will learn how to restore your website from a snapshot. In order to restore your website from a snapshot, the snapshot needs to have been created when the website was operating correctly. In other words, you can’t take a snapshot of a broken website, restore it, and expect it to work correctly. 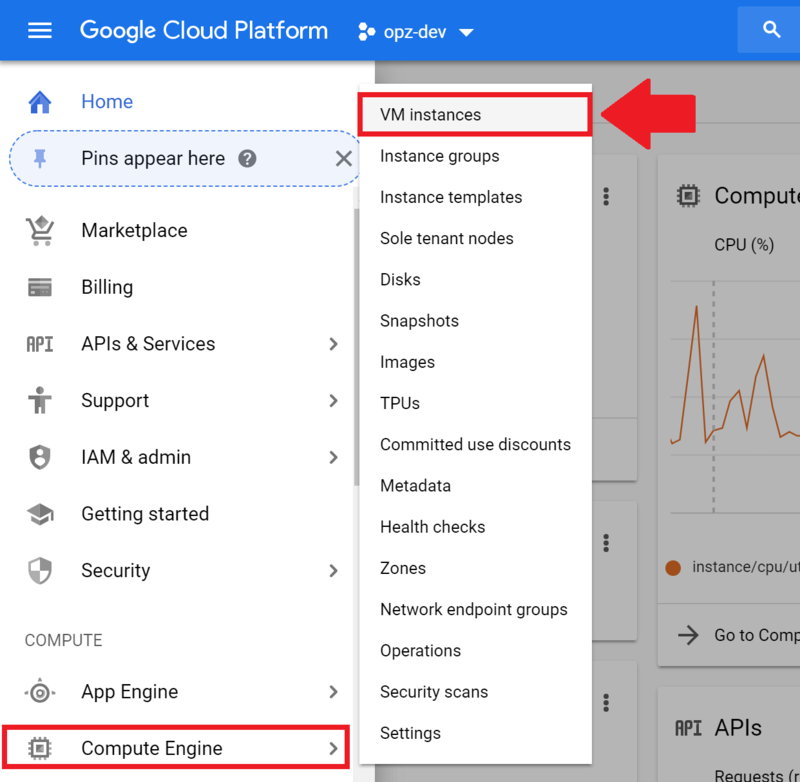 From your Google Cloud dashboard, navigate to Compute Engine then VM Instances. 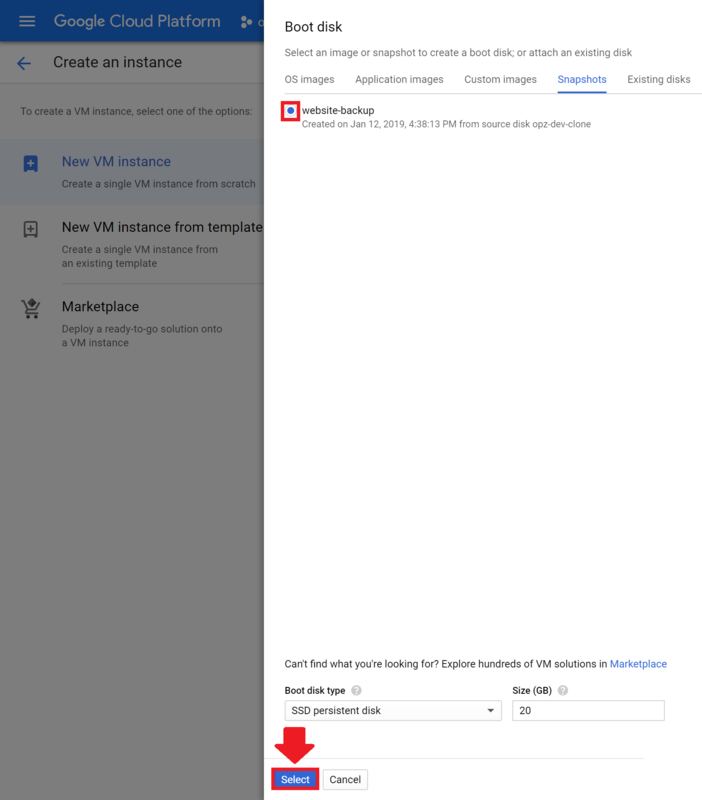 On your VM Instances dashboard, click on the CREATE INSTANCE button at the top of the page. On the Create an Instance settings page, click on the button to change your boot disk. 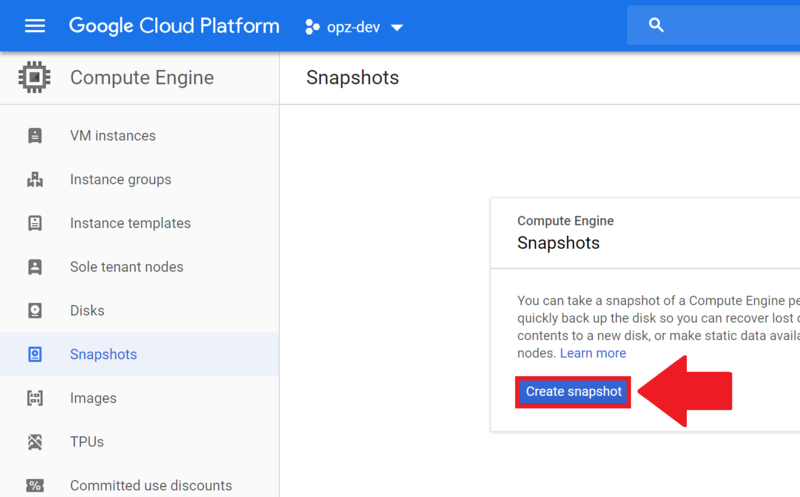 In the popup window, navigate to the Snapshots tab at the top of the page, and select the snapshot that you created in the Create a Backup section of the tutorial. After selecting the Boot disk, check the boxes for both Allow HTTP traffic and Allow HTTPS traffic, then click the Create button at the bottom of the page. If your instance was created successfully, it will appear in your Compute Enginedashboard. In this section of the tutorial, you will configure your website’s network settings to redirect traffic to the new instance. 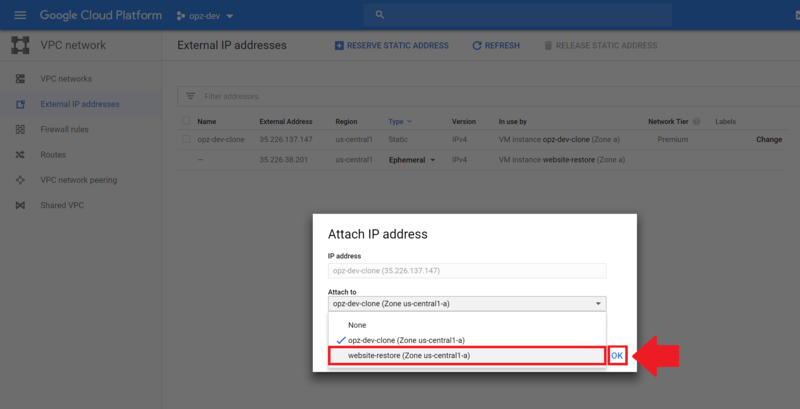 From the Google Cloud sidebar menu, navigate to Network services, then External IP addresses. From your External IP Addresses dashboard, click on the Change button next to the IP address attached to the instance that’s running your broken website. In the Attach IP address window, select the restored instance from the Attach to drop-down list, then click the OK button. 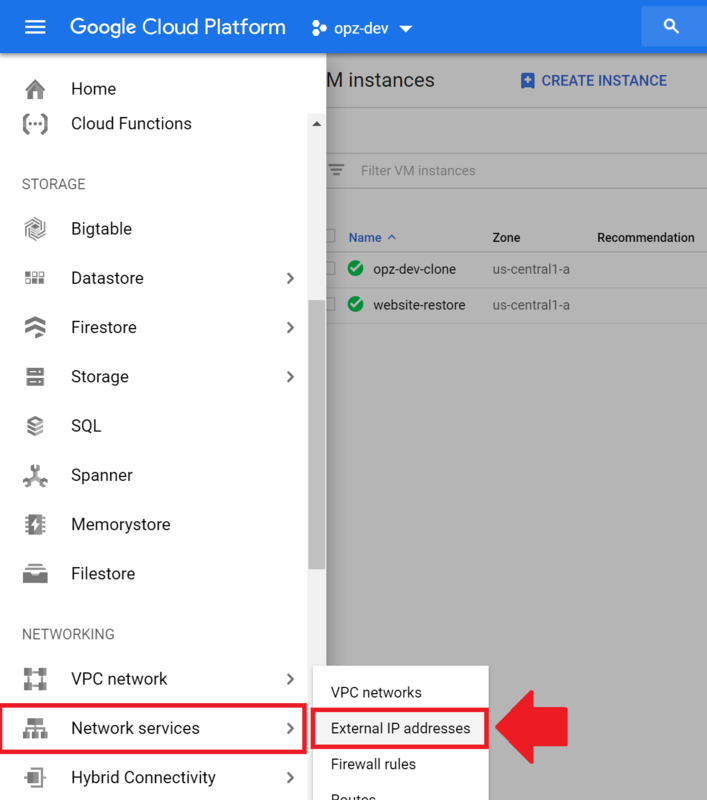 After changing your network settings, you should notice that your static IP address is now attached to the restored instance. Now that you’ve restored your website, you should be able to view it in your browser! 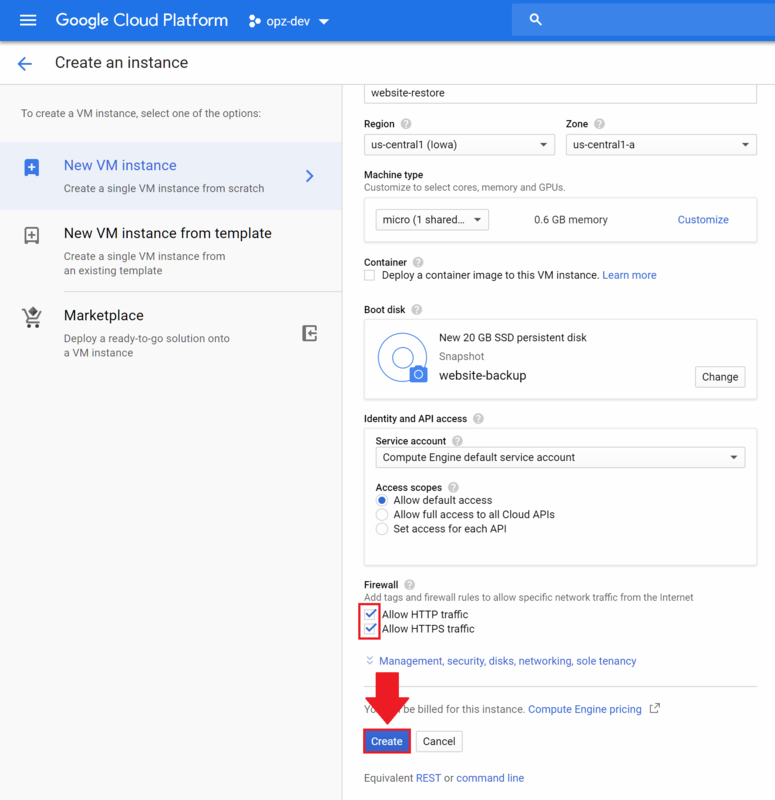 Now that you know how to safely backup and restore websites on Google Cloud, you may be interested in automating your backups! For improved reliability, you should take these preliminary steps before creating snapshots.